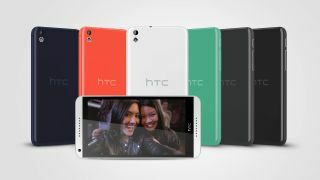 Among the glut of phones at MWC 2014, HTC revealed what it is calling its 'flagship mid-range' device, the HTC Desire 816. We knew that HTC wouldn't be offering up information on its successor to the HTC One - you have to wait until 25 March for that - but what we did get from HTC was a decent mid-range device that comes equipped with some rather impressive specs. This Android-toting phone has been given a sizeable 5.5-inch display, weighs in at 165g and has the following dimensions: 156.6 x 78.7 x 7.99 mm. Looks-wise, it isn't a million miles away from the HTC One – making this a desirable handset for those who don't want to go full-on premium on their phone purchase. The HTC 816 is powered by a quad-core 1.6GHz Snapdragon 400 chip, has 8GB of storage and is equipped with 1.5GB of RAM. If 8GB isn't capacious enough for you then don't panic as you expand up to 64GB more when you make use of the microSD card slot. There's NFC on board, as well as DLNA connectivity, Bluetooth 4.0, Wi-Fi and the all-important 4G/LTE functionality. Battery life on the HTC Desire 816 is decent too – on-board is a 2600mAH battery which means you will have lots of juice to pump music through the dual-front speakers on the device. These, as with other HTC handsets, come complete with HTC Boomsound. When it comes to the camera, there's a 13MP sensor on the back as well as a 5MP front camera and 1080p video recording capabilities. If that wasn't enough, HTC revealed that it also has another handset coming out. Called the HTC Desire 610, this is a mid-range handset that also comes with a quad-core processor and 4G but the rest of the specs have been toned down – especially when compared to the Desire 816. There is 1GB RAM on board, an 8MP camera, 720p recording and 1.3MP front camera. You still get the dual speakers and HTC Boomsound, though so all is not lost. The HTC Desire 816 release date globally is April, while the HTC Desire 610 has been given a May release for Europe only so far.